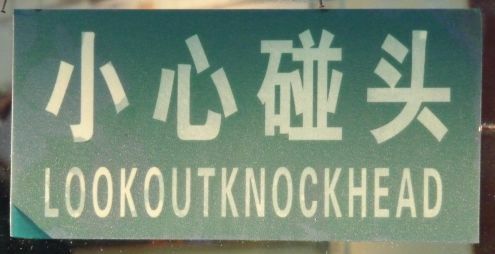 Chinglish is English which has been inaccurately translated into Chinese. I always thought its prevalence on signs and notices in China was overstated. Until, that is, I visited to China for myself in 2009. Here are five of the best examples I spotted on that three week trip. Spotted at Chengdu Panda Base. Please, please drop me a line if you know what this means. If you happen to visit the Great Wall at Mutianyu, make sure you don’t lose your head. Or something. There must be a lot of concern for people’s heads. Spotted at the Summer Palace. I think I had a curry with similar after-effects once. The Olympic Park in Beijing has various friendly signs encouraging you not to do things. 2. No idea unless I see its Chinese version. 3. Don’t bump your head. 5. Chinese is addicted with poetry. Hi nkk- thanks for the comment, and for the clarification. 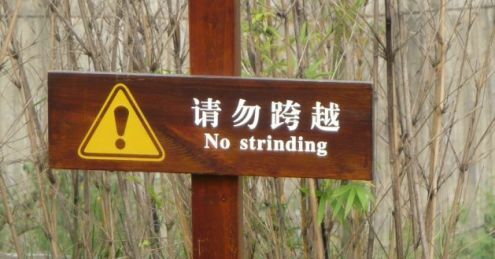 I’ve been wondering about ‘no strinding’ for nearly 18 months now! I rather like ‘the grass is similing at you’ actually; much better than ‘KEEP OFF THE GRASS’! The grass is smiling at you is just an example, there are many similar humorous signs in China. As long as they use correct English, I think that should be fined.